The UniPower is a single-speed winch that combines the advantages of a low-profile manual winch with the power of a 12-volt or 24-volt, low-amp-draw motor. What makes it unique is that the motor is partially imbedded inside the drum, so that it extends only 4 1/8 inches (105 mm) below the winch base - a critical feature for small boats where space under the cabin top is limited. save weight. Composite roller bearings reduce friction under load and don't require lubrication. The stripper arm and load-carrying gears on both aluminum and chrome versions are 17-4PH stainless steel for strength and durability. The UniPower is designed with a maximum pull of 900 kg (1,984 lb). 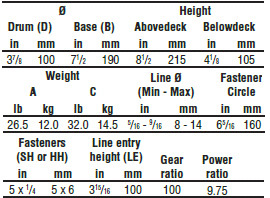 Harken's WLC200R load controller keeps the winch from exceeding this limit. In case the boat loses power, the winch can be operated manually using a winch handle. The UniPower winch package includes a winch, one-speed control box, WLC200R Harken load controller, and a waterproof switch. Q: I'D LIKE TO MOUNT AN ELECTRIC WINCH ON THE CABIN TOP, BUT IT LIMITS SPACE BELOW. ANY SUGGESTIONS? 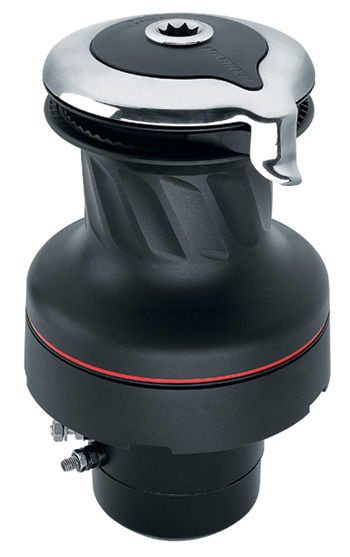 A: The motor on the Harken UniPower winch is partially embedded inside the drum and extends only 4 1/8 inches (105 mm) below the base. This gives crew more headroom as well as space to move around.